Conventional non-reinforced concrete is a brittle material with a low tensile strength and low strain capacity. To improve these mechanical properties of concrete, fibers have been used in the last decades in structural engineering applications in Colombia, South America. In this document, the authors present the mechanical behavior of cantilever beams built with three different concrete mixes: one conventional reinforced concrete mix and two steel fiber reinforced concrete mixes with two percentages of metallic fiber addition (15 kg/m and 30 kg/m). 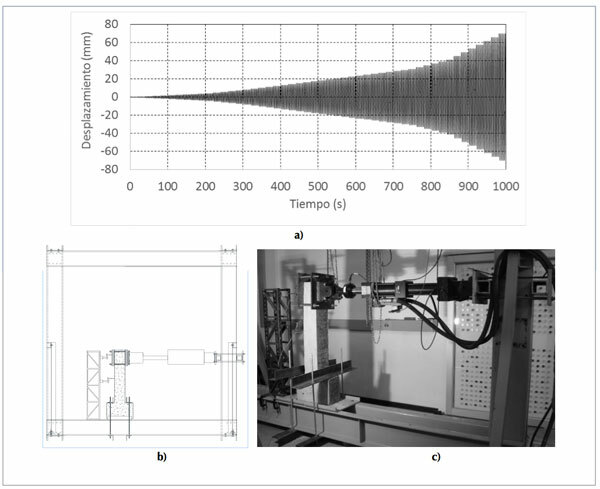 The beams were tested with cyclic displacements applied with a dynamic actuator in order to evaluate the hysteresis loops and the energy dissipation capacity. Based on the results, and for the same displacement, the steel fiber reinforced concrete beams dissipates 160 % more energy than conventional reinforced concrete beams. Additionally, metallic fibers reduce the quantity and length of cracks for high displacement levels. These characteristic could be beneficial for structural applications and specifically for improving the seismic performance of concrete structures. According to Meyer (2009), concrete is one of the most common building materials at global level, due to its versatility and good mechanical performance; therefore, this material has a high demand and studies and researches thereon are carried out on a regular basis. Although concrete presents good compressive strength, it is a brittle material and does not reach big unit deformations for high stress levels. According to Holschemacher et al. (2010), efforts have been made to improve this characteristic through additions allowing the concrete to obtain properties that it cannot develop on its own, both for conventional concretes and heavy-duty concretes. As stated by Marmol (2010), fiber addition in materials such as brick and mortar has been made for decades, but the first breakthrough on this matter was made by Graham in 1911, when he implemented steel fibers to improve the characteristics of concrete. Subsequently, and as reported by Marmol (2010), scientific studies on this subject were undertaken by Griffith in 1920 and Romualdi in 1963. According to Nataraja et al. (2000), the characteristic of metallic fiber reinforced concrete is its capacity to resist stresses, even after a failure occurs in the concrete matrix; the reason is that fibers keep this matrix residually bonded, so that it can further resist stresses even after reaching the maximum strength. This behavior of concrete is highly desirable for structures, especially those located in seismic risk zones. Metallic fibers are made of steel and they usually have a length to diameter ratio between 20 and 100. For functionality, geometry and proportioning reasons, they are classified in microfibers and macrofibers. Microfibers prevent cracking of fresh concrete and they are proportioned in volume percentages between 0.03 and 0.15%, while macrofibers prevent cracking of hardened concrete, and its proportioning varies between 0.2 and 0.8%. The compressive strength does not increase much with the metallic fiber addition, when comparing this effect with the toughness increase achieved with the same addition percentage. However, the technical and scientific literature is quite variable in relation to the real compressive strength increase when adding metallic fibers; some authors like Ding and Kusterle (1999) have stated that the compressive strength increase is insignificant; other authors, like Alfonso and Badillo (2011) have reported compressive strength increases over 20%. On the other hand, the anchorage of metallic fibers in the concrete matrix increases the material's toughness, since fibers help to resist cracking. The study of Holschemacher et al. (2010) demonstrated that the behavior of fibers added to concrete depends on the proportioning and dimensioning and proved that metallic fibers improve the flexural behavior and energy dissipation. Nevertheless, there are not many researches in the technical and scientific literature regarding the performance of concrete with fiber addition in the face of seismic events. Among the studies available in scientific revues dealing with the seismic (or cyclic) behavior of concrete with fibers, we can highlight those reported by K. Ramadevi et al. (2013); G. Kotsovos et al. (2007); Buyle-Bodin, F. and Madhkhan, M., (2002); Dora and Hamid (2012); Ganesan N. et al. (2007); Shakya, K. et al. (2012); Shannag M. et al. (2005) and Sreeja M.D. (2013). In Buyle-Bodin and Madhkhan (2002), structural members were elaborated (columns simultaneously subjected to flexural cyclic loading and constant axial load) with metallic fiber quantities of 20 and 40 kg/m3, which were subjected to axial loads and cyclic loading. The purpose of this study was to evaluate the possibility of replacing the conventional reinforced steel solely by metallic fibers. This study allowed to conclude that the replacement was viable, but in the places where the member was subjected to higher stresses it was necessary to use additional conventional reinforced steel. In the reference Shakya et al. (2012), the possibility of reducing reinforced steel in the nodes was assessed, with the aim of preventing steel accumulation at the joints of railway bridges; therefore, three test specimens were prepared on a 1:6 scale of a beam-column joint. Scale models were tested under cyclic loadings with controlled displacements. The difference between the three test specimens was that one had no metallic fibers and the other two had addition percentages of 1% and 1.5% of the concrete volume. Although the rod reduction in the columns weakens the confinement effect and cracks appear more rapidly in the nodes, it was observed that cylinders with metallic fiber addition presented a much lower number of cracks and spreading was far less than in cylinders without addition. loan (1992) also reports a research dealing with the behaviors of the beam-column joints. A total of four test specimens of concrete frame joints were prepared on a real-size scale. Two specimens were prepared with conventional concrete and the other two used concrete with metallic fiber addition in the nodes. In the two latter specimens, flanges were reduced in the joint. Test specimens were subjected to pseudo-dynamic cyclic loading thereby obtaining the hysteresis loops, and it was concluded that specimens with metallic fiber addition presented a 60% higher load capacity. Similar results were reported in Dora and Hamid (2012). Several studies in Colombia have been related with the mechanical behavior of metallic fiber reinforced concrete, as reported by Alfonso and Badillo (2011) or the study of Cardona (2010). Likewise, the main applications in Colombia have been related mostly to tunnels and industrial floors. However, its use in reinforced concrete frames has not been much investigated in Colombia. This fact calls for the development of this kind of research in Colombia, since it is to be expected that fibers will improve the energy dissipation capacity of framed systems and, consequently, these concrete additions may increase both the seismic force reduction coefficient (R) and the equivalent seismic-hysteretic damping. The present document intends to reduce the knowledge gap regarding concrete members reinforced with fiber additions under cyclic loading. Specifically, the aim is to follow the evolution of damage and energy dissipation in relation to lateral displacement. Different test specimens were prepared with the purpose of characterizing the material and evaluating the energy dissipation capacity of the concrete reinforced with metallic fiber addition. These specimens were prepared with three different types of mixes, which were differentiated by the percentage of metallic fiber addition. The first mix (CC) was conventional concrete, with no addition whatsoever; specimens were elaborated with this mix in order to make comparisons between the material with and without metallic fibers. A second mix (FC1) contained a total of 15 kg/m3 ot metallic fibers, and the third one (FC2) contained 30 kg/m3 ot metallic fibers addition. The metallic fibers were supplied by a company from the productive sector, and they were manufactured in cold-formed steel, with hooks bended in the ends for optimal anchorage. The total length of each fiber was 60 mm with a diameter of 0.9 mm (see figure 1). The nominal tensile strength of the fiber material was 1,160 N/mrrr and a modulus of elasticity of 210000 N/mn2. The mix design used in all cylinders was supplied by an important concrete manufacturer of the construction productive sector; with a design resistance of conventional concrete (without fibers) at 28 days of 21 MPa. Table 1 summarize the designs. It is important to mention that in the mix design two additions with superplasticizers and water reducing effects were used. Additions of 15 and 30 kg/m3 were chosen, because they are the most commonly used in Colombia (although in different applications), and they are in the order of magnitude of those used in several consulted references. With the purpose of characterizing the material, compressive strength tests were carried out according to ICONTEC (2010) and modulus of elasticity tests were performed according to ICONTEC (2006); therefore, 9 cylinders were prepared, 3 for each type of mix. In order to evaluate the toughness of the concrete to be used in all tests, 4 flexural strength tests were carried out, for which 4 joists were made, 2 with the (FC1) mix and the other two with the (FC2) mix. These beams were tested following the reference EFNARC (1996). Table 2 presents the mechanical tests of the evaluated concrete mixes. Additionally, laboratory tests were performed to determine the fineness of the hydraulic cement based on the ICONTEC (1997) reference. The average value of the 5 tests undertaken was 3774 cm2/g. Once the characterization process of the material was over, 6 tests were carried out with pseudo-dynamic loading in reinforced concrete members (2 for each type of mix). For these tests, cantilever beams were built, which were predimensioned considering the loads applied during the tests and the general conditions of the dynamic actuator and the reaction frame. For the experimental design, fiber models were used through the Xtract Software (Moment vs. Curvature and Moment vs. Rotation diagrams), according to the reference of Imbsen and Chadwell (2005), and following the earthquake-resistant design regulation of the reference AIS (2010). 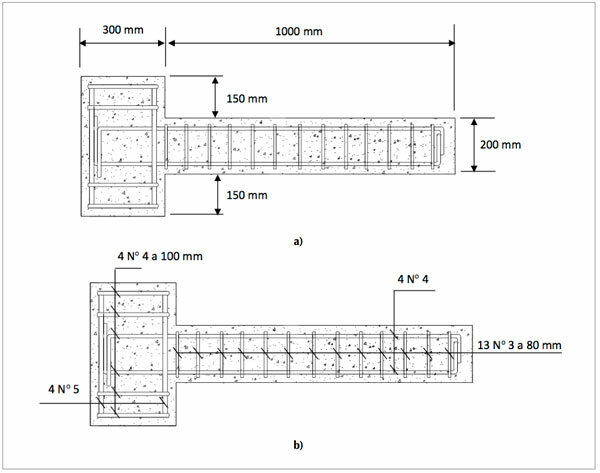 Figure 2a) shows the dimensions of the beams and Figure 2b) shows the location and the type of reinforcing steel bars. In the pseudo-dynamic tests, controlled cyclic (sinusoidal) displacements were applied to the upper part ot the cantilever beams, as shown in Figure 3a). Displacements were small at first, until reaching distortion levels close to 6% of the joists' length. On the other hand, Figures 3b) and 3c) show a drawing and a photograph of the experimental assembly of the laboratory tests. Fhis test assembly and method is similar to that of Canesa N. et al. (2007), although in this case, a larger number of cycles per displacement level were performed and a greater amount of data was available as a consequence of using more technological equipment. 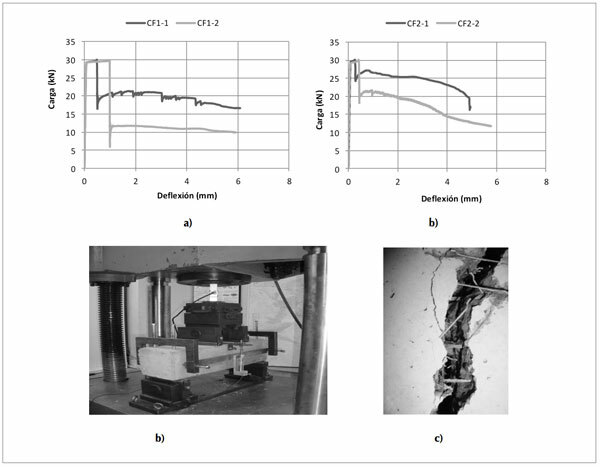 The displacements in Figure 3a) were induced by the MTS dynamic actuator of the Structures Laboratory of the Laboratory of Tests and Trials of the Pontificia Universidad laveriana at a frequency of 3 cycles per minute (load-unload). Additionally, each beam was supplied with LVDT-type electronic transducers (at mid height and total height), with the aim of recording the displacements of the joists in relation to time. This procedure was carried out for all 6 joists built with the different types of mixes, until bringing them to failure at drift levels close to 6%. This failure and drift level was determined through non-linear numerical models of concrete (using moment vs curvature diagrams by the fiber method); and the objective of the tests was to take the plastic hinge ot the cross-section to rotation levels higher than the Life Safety level (LS) and close to the Collapse level (C), according to the definitions contained in ATC (1996). After the tests, the hysteresis cycles of the tested reinforced concrete members were calculated by assessing the dissipated energy in each cycle for different displacement levels. Table 2 shows the values of the compressive strength and modulus of elasticity tests. It can be observed that the mix presenting the highest compressive strength is FC2, followed by the FC1 mix, and finally, the CC mix. This indicates that the FC2 mix presented 26% strength increase, while for the FC1 mix the increase was 11%, in relation to the conventional concrete mix. For the modulus of elasticity tests, similar values were reported for the CC and FC1 mixes, while the joists built with the FC2 mix reported a modulus of elasticity significantly higher than the two other concrete mixes. In the compressive strength test, as well as in the modulus of elasticity test, the concrete mix showing the best performance was the FC2 mix, which had a 30 kg/m3 addition of metallic fibers. The load-deflection curves were determined for the calculation of the flexural strength, based on the EFNARC standard (1996). With regard to the straight line adjusted to the trend curve of the initial linear segment, a parallel line is drawn which is displaced 0.1 mm in the axis of the deflection. The intersection of the line parallel to the straight part of the curve and the load-deflection curve correspond to the first maximum load (P0j); this value is used to find the flexural strength value, which is calculated as an elastic strength to the equivalent traction. Figures 4a) and 4b) show the load-deflection curves for each specimen according to the EFNARC standard, whose typical assembly is shown in Figure 4c). Once the maximum loads P0 jwere obtained, the flexural strength was calculated for each joist, and the resulting data are indicated in Table 2. Based on the results obtained in the flexural strength tests, it is possible to state that, although all cylinders reached a similar maximum flexural loading, the FC1 mix presents a more pronounced strength reduction than the FC2 mix, which indicates that the FC1 mix has a residual strength that is on average lower than the FC2 mix. This implies that the FC2 mix is capable of dissipating more energy once the material reaches the maximum load (initial failure). For example, at a 4 mm displacement, the average residual strength of the cylinders built with the FC1 mix is 2.2 MPa, while those built with the FC2 mix have a residual strength of 3.1 MPa for the same displacement. As shown in Figure 4d), metallic fibers did not fail, some were detached from the concrete matrix, but most of them remained anchored, thus delaying the growth of cracks and providing toughness to the material. Figure 4. a) Flexural strength tests for the FCI mix, h) Flexural strength tests for the FC2 mix, c) Experimental test assembly according to the EFNARC standard (1996), d) Detail of the fiber condition in one of the cracks of the tested cylinders. 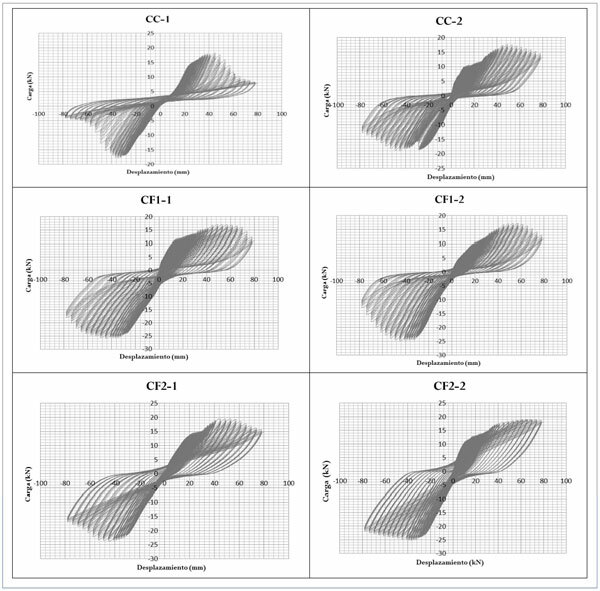 Figure 5 shows the hysteresis cycles resulting from data obtained in the pseudo-dynamic tests. 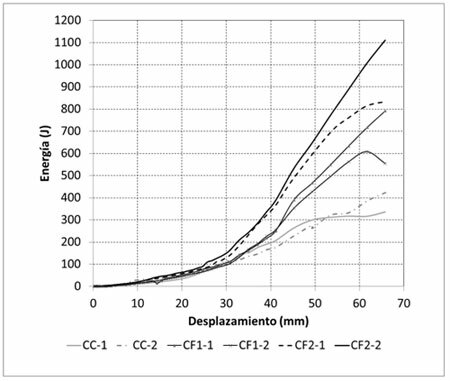 Despite the fact that the objective of the research was not focused on evaluating the flexural strength increase of fiber reinforced concrete, Figure 5 evidences similar maximum strength values for cylinders built with the CC mix and the FC1 mix; while the strength of the beams built with the FC2 mix is 14.7% higher (on average). The objective of the research was focused on assessing the energy dissipated by each mix. Therefore, this energy was calculated through the area inside the hysteresis cycles, according to the recommendations in the reference AFC40 (1996), which was designed for non-linear static methodologies. In order to show this point, Figure 6 summarizes the calculation of the energy dissipated by each hysteresis cycle for different drift levels and each cylinder. The initial trend ot the area dissipated inside the hysteresis cycles is similar for all 6 beams, but when cracks begin to appear, at a displacement close to 10 mm, their behavior changes, because fibers start generating energy dissipation. This behavior is similar to that reported by Sreeja, M. (2013). The trend is clear when both beams built with the same sample present similar behaviors among them. Cylinders built with the CC mix (CC-1 and CC-2) dissipated a maximum energy (average of both cylinders) of 350 J for a displacement of 60 mm, being this energy the lowest among the three evaluated concrete mixes. This was to be expected, since this mix has no metallic fiber addition. The average energy dissipated from the beams built with the FC1 mix, for a displacement of 60 mm, was 662 J. This mix showed a better behavior than that of conventional concrete, because fibers started to act by delaying cracking and increasing the member's equivalent hysteretic damping. This behavior and the higher energy dissipation seem to imply that the seismic performance of frames built with this mix is better than that of the frames built with the CC mix. Finally, experimental results suggest that the performance of the FC2 mix was better than that of the FC1 and CC mixes. The great capacity to dissipate energy from the beams built with the FC2 mix, in relation to the other mixes, becomes evident as from displacements close to 30 mm. These specimens with 30 kg/m3 metallic fiber addition reached average energy dissipation levels at 60 mm of 911 J, which evidences that metallic fibers improve the behavior ot the structural members subjected to cyclic loadings. These results regarding the increase of the amount ot energy dissipated by fiber reinforced concrete are similar to the findings of Shannag M., Abu-Dyya N., Abu-Farsakh C. (2005) (although for ultra-heavy-duty concrete). This reference reports increases up to 20 times in the energy dissipation capacity when comparing fiber reinforced concrete with concrete without fibers. It is worth highlighting that, despite the fact that the energy dissipation levels of the FC1 and FC2 mixes are 189% and 260% higher (respectively) than that of the CC mix, this dissipation presents lower damage levels and much less cracking, as observed in Figure 7. 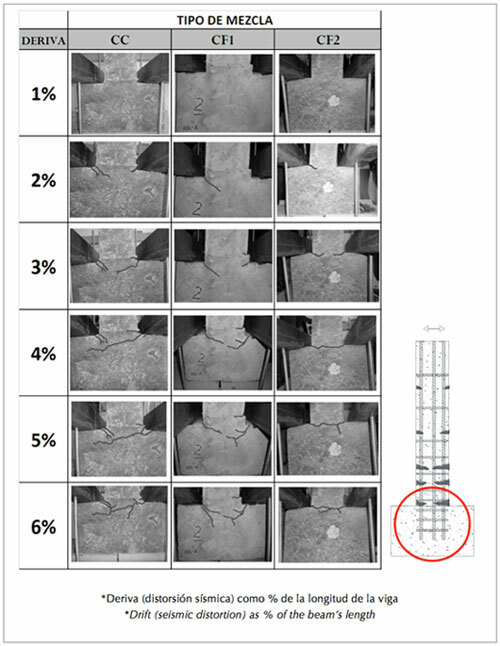 This figure shows the damages in the bottom node of the cantilever beams tested for different drift levels and for all three studied mixes. The experimental evidence indicates that cracking is related with the quantity of metallic fibers added to the concrete mix. For the beams built with the CC mix, cracks began to be highly visible as from 20 mm displacements; in the end, the final result are specimens with a great number of cracks. In the case of the cylinders built with the FC1 mix, cracks started at displacements close to 20 mm, spreading in a similar way as the cylinders with the CC mix, but they became bigger at 30 mm. The final condition of the specimens built with the FC1 mix was much better than that of the CC mix, since the metallic fibers were capable of dissipating more energy and prevent cracking. Finally, the beams built with the FC2 mix presented the lowest damage level, because their high content of metallic fibers allowed them to dissipate more energy and prevent the spreading of cracks. The final result of the FC2 specimens was very satisfactory, because they did not end in a bad condition as those built with the CC mix. In general terms, Figure 7 shows a clear comparison between beams built with the different mixes. It can be observed that the greater the displacement, the higher the number of cracks in the beams; furthermore, damages decrease as the addition of fibers in the concrete mix increases. Keeping this information in mind, it is possible to conclude that metallic fibers contribute in a remarkable way to counteract the damage level in reinforced concrete cantilever beams in the event of cyclic motions like ground displacements during earthquakes. • Metallic fibers moderately increase the compressive strength and the modulus of elasticity of concrete. When using fiber addition of 30 kg/m3, the contribution of fibers was more evident than for the addition of 15 kg/m3, with increases of 26% in compressive strength and 22% in the modulus of elasticity, in relation to the conventional concrete mix. For cylinders built with the FC1 mix, the compressive strength increased by 11% and the modulus of elasticity was almost the same than for cylinders built with the CC mix. • The energy dissipation capacity increases proportionally to the percentage of metallic fiber addition in the concrete mixes. The energy dissipated by beams built with the FC2 mix was on average 911 J for a 60 mm displacement, while for the beams of the FC1 mix, the dissipated energy (average of the two tested cylinders) did not exceed the 662 J for the same displacement level. This dissipated energy is much higher than the energy absorbed by the beams built with the concrete mix without fibers (350 J). • The damage level in the different types of mix changed considerably, considering the cracking formation process, and the final result of the tested specimens. In the case of conventional concrete, cracks appeared in the specimens by displacements lower than the beams built with the FC1 and FC2 mixes, and the spreading speed of these cracks was much higher than in the other cases. The final condition of the specimens built with CC was quite deficient, since concrete suffered strong scaling, especially near to the node. • For beams built with the FC1 mix, cracks appeared by displacements similar to the beams built with CC, but the spreading speed was lower; in the end, specimens had less cracks, just some scaling signals in the material. Finally, in the case of the beams built with FC2, cracks appeared at greater displacements than for the first two cases; the final condition of the specimens built with this mix was the most satisfactory, since the number, length and thickness of the cracks was significantly lower than in the cylinders built with the CC and FC1 mixes. • Considering the above information, it is possible to conclude that metallic fibers contribute in a remarkable way to counteract the damage level in reinforced concrete cantilever beams in the event of cyclic motions. According to the experimental evidence, metallic fibers confine the concrete from the central part of the node, controlling the cracking and reducing potential brittle failures. This behavior is desirable in earthquake-resistant structures. • The behavior of the beams in the elastic range is the same for all mixes, since metallic fibers start to act once the cracks begin to appear and when the inelastic range is reached. The authors wish to thank the Vicerectory of Academic Affairs of the Pontificia Universidad Javeriana for the funds granted for the development of the research project that allowed obtaining the results presented in this paper. Likewise, they wish to thank the Laboratory of Tests and Essays of the Department of Civil Engineering of the Pontificia Universidad Javeriana for making the experimental process reported in this document. And finally, they thank the companies BEKAERT S.A. and CEMEX Colombia S.A. for supplying the materials needed for the research. Profesor Asociado, Departamento de Ingeniería Civil, Pontificia Universidad Javeriana. Calle 40 No. 5-50 Ed. José Gabriel Maldonado, S.J., Bogotá, Colombia.